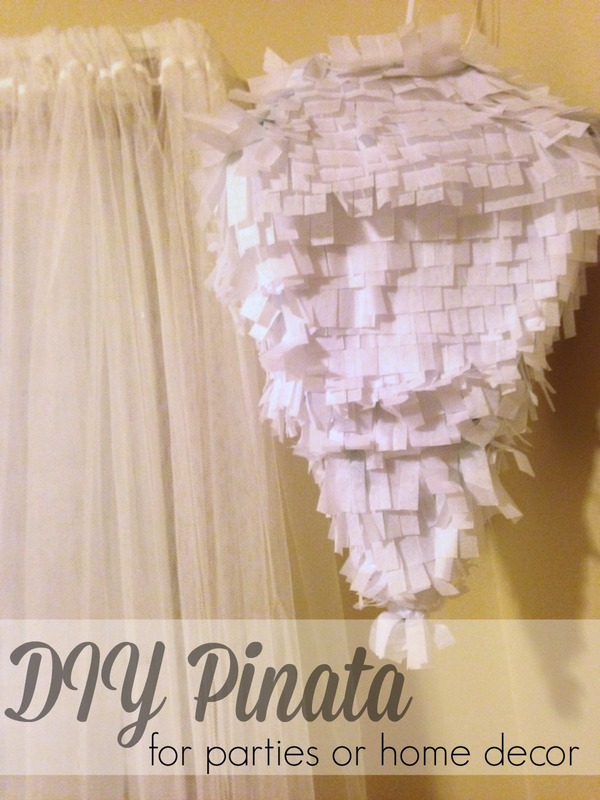 Today I wanted to share a really simple geometric pinata for party decor. Pinata making was something I was wanting to experiment with, but lots of the DIY's I found either involved paper mache - which I didn't want to do, or were complicated shapes for a beginner like moi. A diamond shape sounded like a good place to start because I could add other geometric shapes and sizes to it if I wanted to cluster them together. Gather all your supplies first. I used a sheet of copy paper to make my template. At the top of the paper, I measured to the center of the sheet (portrait orientation), then drew a line from that point to the bottom two corners. I cut off the sides and was left with the center triangle. I wanted to do four sides so I traced my pattern onto the cardboard four times. Then I cut a 4" x 4" square out of the cardboard and punched two side-by-side holes in the center. This piece was my top. Then I cut four pieces that were trapezoid shaped, 4" on one side and 8-1/2" on the other side. These pieces would sit on top of the 4 triangles. Tape together the four triangles so they layout in a curved line. (I used green tape simply so that you could see it easily in this post.) 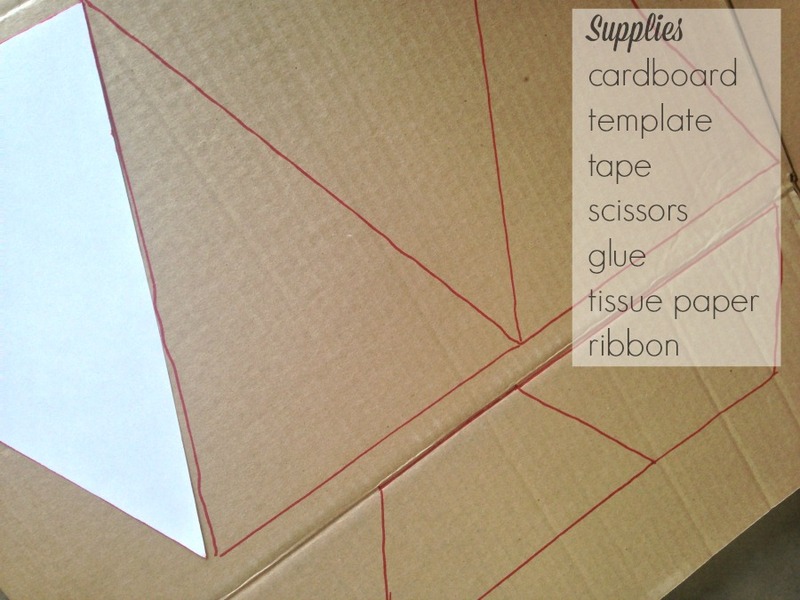 Tape a trapezoid to each triangle. Now you're ready to connect the two ends of the diamond. Your tape is going to move a bit - just make sure you press it all back down. Leave the top off for right now. Next you start cutting strips of tissue paper. I cut about 5 strips out of a sheet, cutting length-wise. Then I created the fringe by cutting slits into the strips about 3/4" wide. 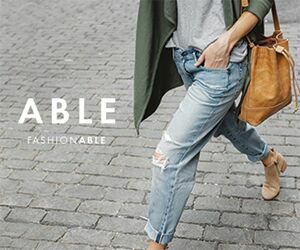 This part doesn't have to be perfect. Working from the bottom to the top, start gluing the strips to the cardboard. The bottom point was a little tricky but I promise it turns out fine. 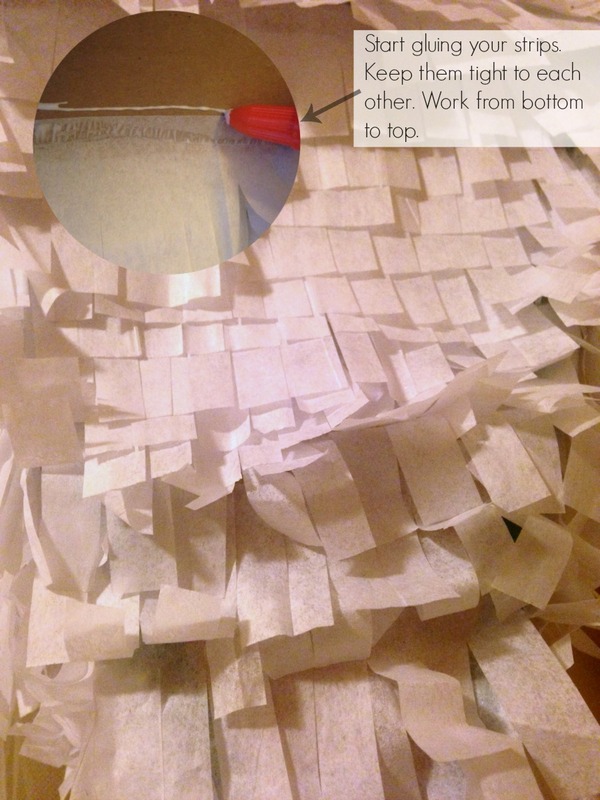 Keep your strips of paper very close together. Since I used only one color, I was able to keep my strips long which wrap around the bottom portion of the diamond several times. 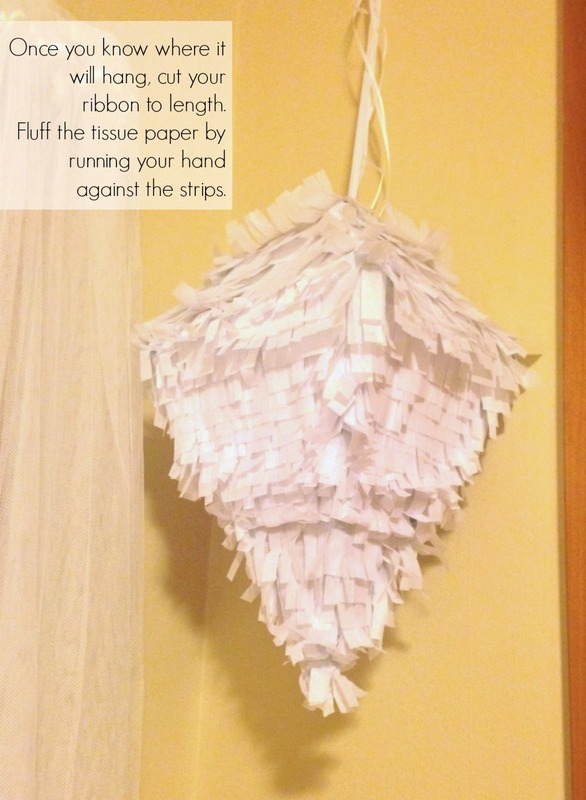 This helps to hold your pinata together as well. If you wanted to add a stripe or a chevron pattern, you would just need to cut your strips into smaller sizes. It takes a little more math but I think it would be worth the extra time to create a really fun pattern. 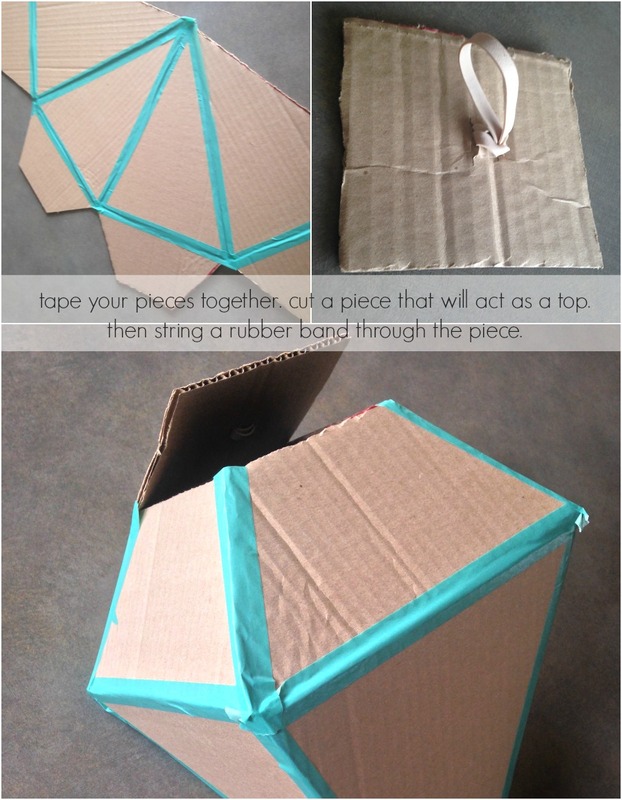 Cover the top piece with a few strips of tissue paper. If you are filling your pinata, now is the time to do it. Now add some glue around all four sides of the top and press it into place. Cut your ribbon to length and tie it onto the rubber band. You're all done. I want to make a few more of these in different colors and sizes to cluster together. I think they would make a gorgeous dance floor center piece for a wedding. What shape should I try next? What color pinata would you make if you were making one?